On Friday's edition of Connect the World on CNN International, former Lebanese Prime Minister Saad Hariri speaks out on the car bombing that killed Brig. Gen. Wissam al-Hassan, a top Lebanese intelligence official known for his anti-Syrian stance, in Beirut. 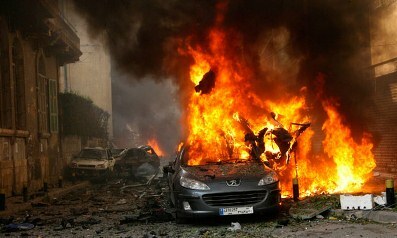 Read more about Friday's car bombing in Beirut here. BEIRUT: Former Prime Minister Saad Hariri told CNN Friday that Syria’s President Bashar Assad was behind the recent car bombing in Beirut that claimed the life of police Information Branch chief Brig. Gen. Wissam Hasan. He said the motive behind the assassination was Hasan’s recent uncovering of a bomb plot involving former Information Minister Michel Samaha, a pro-Syrian Lebanese figure who was accused in August of plotting a terrorist attack in the north of the country. What follows are excerpts from CNN’s interview with Hariri. CNN: What is your response to the bombing in Beirut today? Hariri: Obviously the regime in Syria will not stop at anything to achieve his livelihood. We always thought that Bachar el Assad has killed Rafic Hariri and today he has also killed Wissam al Hassan who unveiled a big plot in Lebanon. A former Lebanese minister, Mr. Michel Samaha, was caught red handed with about 50 kilos of explosives that were given by Ali Mamlouk, the top intelligence agent in Syria, to have them explode in Lebanon. And the tapes that Wissam el Hassan had from the arrest of Michel Samaha obviously stated that Bachar el Assad gave the orders to Ali Mamlouk to do all these actions. CNN: Hezbollah in Lebanon strongly condemned the bombing today, you’re telling me that you have evidence that Syria and/or its allies are beyond this killing, you’re saying that it is Bachar Assad himself? Hariri: A month ago, Wissam el Hassan caught red handed a former Lebanese minister , Michel Samaha, with 50 kg of explosives due to explode in Lebanon. Fortunately at the time, Wissam el Hassan was able to catch the former minister and unfortunately today Wissam el Hassan paid the price of his success just a month and half ago. This regime is killing his own people so he will not even think twice about killing the Lebanese. And we all know that the threats that were given to Wissam el Hassan in the past few weeks were from the allies of Bachar el Assad in Lebanon and outside Lebanon. CNN: If Syria is behind this bombing in Beirut, what do you think the message from Damascus is tonight? Hariri: The message from Damascus tonight is: anywhere you are, if you are against the regime, we will come and get you. Obviously they are saying to the Lebanese people that no matter what you try to do, we will keep on assassinating the Lebanese, until we become what Hezbollah and his allies are. CNN: What sort of influence do you think Syria has on Lebanon and its politics today? Hariri: Syria today is becoming a proxy of Iran, as also some of the allies of Syria in Lebanon are proxies of Syria and proxies of Iran. Today when we’re talking about Syria, we’re talking about Syria and the allies of Syria in Lebanon. Unfortunately some of the allies of Syria have gone as far sending Lebanese to Syria to fight alongside the regime, against the free will of the people, who want to change the regime. And that’s a big problem for us in Lebanon. Syria has always had an influence on Lebanon but it has never been done that some Lebanese fought alongside the regime, for the sake of the regime. CNN: What happens next, how does Lebanon prevent itself getting sucked into this crisis, what would you expect to see next if you were still prime minister for example? Hariri: I believe that this regime in the end of the day will fall apart; we cannot be standing with the regime against the people of Syria, therefore our political position has been to stand with the people of Syria, because the regime is here today but in a year time or 6 months-4 months time, it will fall apart and the people will choose a new leader for Syria. We don’t want to be in the middle of a conflict between the regime and the people. We support the people because they are trying to get a democratic president in Syria. Unfortunately Bachar el Assad has done everything and used every single weapon to destroy his own people, to stay in power. So my actions would be to stand against Bachar el Assad, if I were prime minister, and say very clearly that anything that will come into Lebanon, if the regime is trying to export its terrorists to Lebanon, we would definitely refuse it. CNN: We’re looking at the picture of the bombing. Who do you think has the technical ability to carry out a bombing like this? Hariri: I think the regime has many tools in Lebanon and I cannot specifically tell you who has the capability. Unfortunately Lebanon is, security wise, quite open so there are many players who can do something like this, but obviously allies of Syria would do something like this.